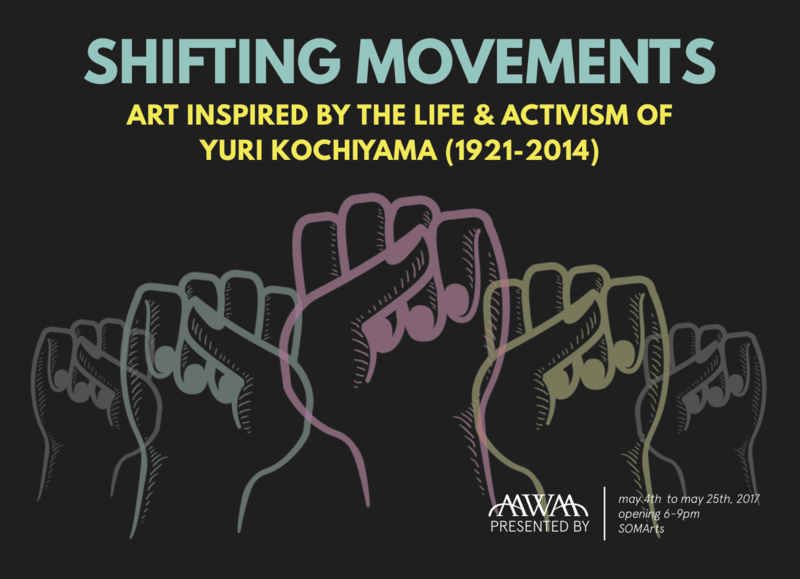 SAN FRANCISCO, CA – March 13th, 2017 – Asian American Women Artists Association (AAWAA) and the Asian Pacific Islander Cultural Center (APICC) join forces to present the multidisciplinary art exhibition Shifting Movements: Art Inspired by the Life & Activism of Yuri Kochiyama (1921-2014), as part of the United States of Asian America Festival opening on May 4th, 2017 through May 25th, 2017 at SOMArts Cultural Center, 934 Brannan St, San Francisco, CA. Shifting Movements: Art Inspired by the Life and Activism of Yuri Kochiyama (1921-2014) is a multimedia exhibition featuring over 40 artists primarily from Asian Pacific American, African-American, and Latin communities, illuminating the legacy of intersectional revolutionary social activist Yuri Kochiyama. The artworks highlight the values and themes which guided her, and the incredibly diverse people, struggles, and movements that inspired a lifetime commitment to fighting for a more humane and just world. Relating Kochiyama’s mission to our contemporary context, artists ruminate on a myriad of urgently relevant topics such as the similarities between WWII Japanese Internment and the festering post-9/11 Islamophobia, the experience of immigrants, refugees and people of color, structural racism and police violence, and the everyday labor that fuels substantive social change. Kochiyama showed up for all who needed help, including African, Asian, Latino, and Native American communities, and inspired artists across multiple cultures and generations. Honoring Kochiyama’s intended legacy of inspiring people to “build bridges, not walls”, Shifting Movements artists invite audiences to make connections between the past, present, and future – and each other. AAWAA moves beyond the circle of Asian American women artists. Following the inclusionary philosophy championed by Kochiyama, this historically significant exhibition includes talented and powerful artists from multiple generations, ethnic backgrounds, and gender identities. Shifting Movements showcases provocatively brilliant art driven by the artists’ abiding passion for social justice. In addition to art, film, performance and literary works, Shifting Movements will feature a Yuri Kochiyama biographical timeline, oral history recordings, the Smithsonian APA Center online exhibition Folk Hero: Remembering Yuri Kochiyama Through Grassroots Art , and a community wall public art installation. The opening reception, May 4th from 6:00pm-9:00pm, will feature performances by Dnaga, Susan Almazol, and the participatory installation “Sugar Rebels” by Genevieve Erin O’Brien, and a pop-up shop featuring affordable artwork by Shifting Movements artists. Shifting Movements: Art Inspired by the Life & Activism of Yuri Kochiyama (1921-2014) is curated by Michelle A. Lee ( Eating Cultures , Hungry Ghosts ) featuring artists selected by activist and curator Melorra Green and feminist poet, new media artist, and scholar Margaret Rhee. Invited artists include Sigi Arnejo and People’s Kitchen Collective. *Additional details to be announced. Admission to the exhibition and programs is open to the public. AAWAA advances the visibility and recognition of Asian American women in the arts. Through exhibitions, publications, public programs and an informative website, AAWAA is an accessible resource and portal for educators, academics, researchers, arts and social justice communities and the general public. The Asian Pacific Islander Cultural Center’s (APICC) mission is to support and produce multidisciplinary art reflective of the unique experiences of Asian Pacific Islanders living in the United States. Since 1998, the Center has promoted the artistic and organizational growth of the City’s Asian/Pacific arts community by organizing and presenting the annual United States of Asian America Festival. For more information on APICC and its mission and programs, please visit www.apiculturalcenter.org . Contact APICC at 934 Brannan Street, San Francisco, CA 94103, (415) 829-9467, info@apiculturalcenter.org.